By the 22nd century, after climatic change and rising sea levels, the city of Vancouver is divided between prosperous but regressive and cliquish Guild territory and the island of Downtown, whose slums are inhabited by the Guildless, refugees from America, gangs, criminals, and the destitute. When Klale Renhardt’s father finally dies, having been treated shamefully by his Guild, she rejects the Fishers Guild and attempts to make a new life in Downtown. Intimidated and out of her depth, Klale takes refuge in the lesbian KlonDyke nightclub, and wheedles a job out of weary bartender Toni. The club’s owner, Mary Smarch, invests heavily in community action and supports the latest redevelopment proposals. Downtown’s tongs, however, oppose the plans, and a tong war’s in the offing. Also hanging around the club is Blade, blackmailer Choi Shung Wai’s huge enforcer. Taken as a child, Blade was tortured, brainwashed, and reprogrammed. 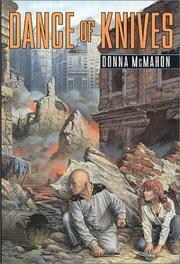 Once involved in the business herself, Toni glimpses a personality remnant of the original boy, Simon, inside Blade, and decides to try to help him. But there’s a problem: Blade protects the club, but somehow a spy’s getting information back to Choi. When the blackmailer offers to buy the club, Mary temporizes. Further complications result from Klale’s crusade against crooked Harbor Patrol officer Baljeet Dhillon. A brisk, well-constructed swirl of murky plots and dark psychology, if rather heavy on the lesbian angle: a debut that, despite impressive ingredients, lacks warmth.